A Yale MFA graduate and distinguished visual arts educator for over two decades, his work is held in private and corporate collections, and has appeared in films, newspapers, journals and other media. He currently lives and paints in the Clinton Hill/Bedford-Stuyvesant section of Brooklyn, and teaches drawing and painting at Gramercy Arts HS in Manhattan. During the 1970s and 1980s, parts of New York City became severely blighted by foreclosure, arson and abandonment. Once vibrant neighborhoods fell silent, as families that had the means fled the waves of crime and drugs that followed. Harlem, The Lower East Side, The South Bronx and parts of Brooklyn such as Bushwick, Brownsville and Bed-Stuy resembled battlefields after the war, except for the fact that the refugees had never been relocated. Today, sections of practically every big city in America are being consumed by this same pattern, as the current economic recession inflicts its deadly toll. 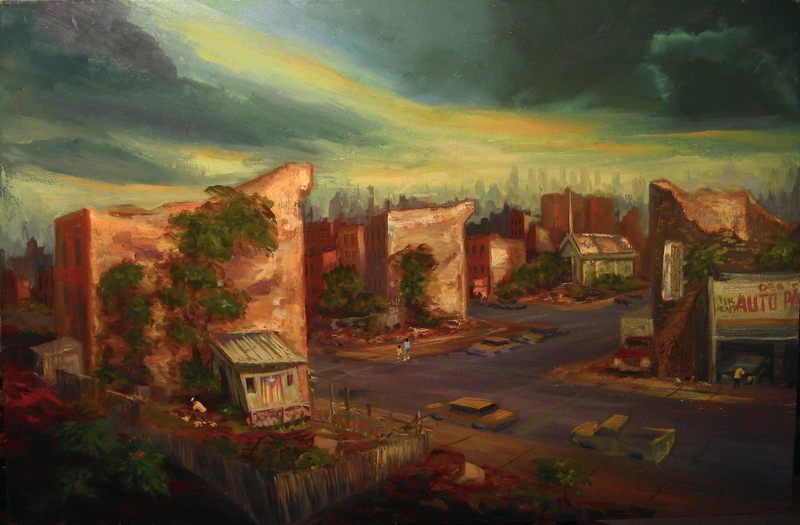 These paintings are based on drawings of and daily experiences in transitional neighborhoods beginning in the mid 1970s up to the present day. As a child growing up in a part of Manhattan where the city tried to reduce crime and chaos by using “slum clearance”, forcibly removing close to 7000 mostly Black and Puerto Rican tenement dwelling families by destroying and bulldozing their homes, I could never reconcile the tale of two cities that was and is New York. Commuting daily as a high school student through Harlem and the Bronx via the elevated Broadway Local provided me with a multitude of visual epiphanies. Teaching art in the Bronx from 1985-90, my daily commute through East Harlem, Morrisania and Hunts Point was my own education in urban neglect. Currently residing and painting in Bed-Stuy, Brooklyn is my ongoing seminar in urban disenfranchisement. The American Urban Ghetto, where promise and despair perform a never-ending dance, reads like a cryptic code absent a thorough examination. Complex layers of meaning accrue, springing like ailanthus trees growing through the charred interior of an abandoned building. It is here where spirits regularly make themselves seen, wandering through the contorted debris of civilization in a place that was not too long ago farmland. The cityscapes are painted from on-site drawings, memories and photographs I’ve shot. Having grown up in NYC and living almost my entire life here, they are also internal landscapes, the terrain of my subconscious. I am drawn to moments and situations that resonate, sometimes simply through a strange or poignant juxtaposition of elements. Manhattan is a distant Babylon/Oz when viewed from the perspective of the surrounding boroughs. Crumbling, vacant factories and tenements appear timeless when seen against a broad expanse of sky. 1998 “Side Streets”, Merchant–Ivory Production. Paintings appeared in film.